VLC is a powerful software media player that can play just about any audio or video format you care to try. It's also a stellar alternative to Windows Media Player or iTunes for managing digital media files. However, if you're not that familiar with its unique interface, then it can take some to get used to. It's not difficult to learn by any means, but the way you do things in VLC Media Player can be quite different to what you may be accustomed to. If you want to move over to VLC Media Player then one of the first tasks you'll want to do is set up your media library. At first glance, there doesn't seem to be many options. Out of the box, the interface is very minimal, but under the hood, there is a lot to play with. Before you follow the rest of this guide, ensure you have the latest version of VLC Media Player installed on your computer. If you have it on your system then you probably already have the latest version -- the program automatically checks this every two weeks. However, you can run the update checker anytime by clicking Help > Check For Updates. The first thing to do is switch the view mode. To do this, click the View menu tab at the top of the screen and then click Playlist. Alternatively, you can hold down the CTRL key on your keyboard and press the L button to achieve the same thing. Before adding any music it's a good idea to configure VLC Media Player to automatically save and reload your media library every time the program is started. To do this, click the Tools menu tab and select Preferences. Switch to the Advanced menu via the Show Settings section (near the bottom left-hand side of the screen). Just click the radio button next to All to get a whole lot more options. Click the Playlist option in the left pane. Enable the Use Media Library option by clicking the checkbox next to it. Now that you've set up VLC Media Player it's time to add some music. Click the Media Library option in the left window pane. Chances are you've got all your music in one main folder on your computer or external hard drive. If this is the case, and you want to add everything in one go, then right-click your mouse button anywhere on the main part of the screen (the blank bit). Select the Add Folder option. Navigate to where your music folder is located, highlight it with the left mouse button, and then click the Select Folder button. 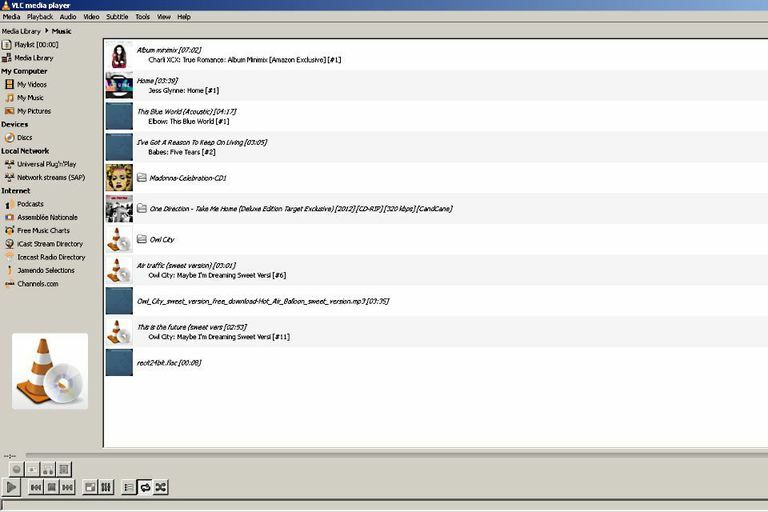 You should now see that the folder containing your music has now been added to the VLC media library. If you've got multiple folders that you want to add, then simply repeat steps 2 - 5. You can also add single files too using this method. Instead of choosing to add a folder (as in step 3), select the option to add a file when you right-click on the main screen. Once you have finished adding folders and files, you can navigate through folders and sub-folders by double-clicking on them -- just like you would in Windows. Use the search box near the top of the screen to quickly find a particular artist/song.